With another round of killings and the recent reclassification of a decades-old shooting as a homicide, the last week of December in Baltimore has been rather depressing. Death and despair are all too common on inner city streets. On Wednesday, the city logged its 343rd homicide for the year, plus, set a new record for killings per capita. Violent crime spiked in 2015 after the death of Freddie Gray, which triggered the riots and a crime wave of murders continuing today. The homicide rate for 2017 is now 55.88 killings per 100,000 people, according to The Baltimore Sun. The previous record was set in 2015 at 55.35 per 100,000. Today’s homicides are now at levels not seen since the early 1990s when the population was 100,000 higher. Officers called to the 3700 block of Arcadia Ave. in the Langston Hughes neighborhood of Northwest Baltimore at about 4:40 p.m. Tuesday found 18-year-old Quincy Hammonds with gunshot wounds to his body, police said. Hammonds, of the 1900 block of Middleview Court, was taken to a local hospital, where he died, police said. Officers responding to a report of a shooting near the intersection of 38th Street and Old York Road in the Waverly neighborhood of North Baltimore at about 10:04 p.m. found an unresponsive male victim with gunshot wounds in a crashed vehicle in the 3700 block of Ellerslie Ave., police said. He was transported to a local hospital, where he was pronounced dead, police said. Police on Wednesday also announced the death of William Wallace, 38. Wallace was shot in the head on June 15, 1995, in the 800 block of Durham St. in East Baltimore. He suffered a seizure in Heritage Crossing on Sept. 4 and was found unresponsive. The medical examiner has ruled Wallace’s death a homicide as a result of the injuries he suffered in the 1995 shooting, police said. Later Wednesday, officers responded to the 200 block of N. Hilton Street and found a man suffering from a gunshot wound to his back. He was taken to a hospital, where he died of his injuries. Police believe the man was in the 200 block of Monastery Avenue when he was shot. Homicide detectives are investigating. Here is a video of the 200th homicide scene. A unique, unbiased perspective of the war zone festering in Baltimore, that the general public is not allowed to see. According to the FBI, homicides and violent crime have been on the rise in the U.S. for the past few years, with much of it coming from Chicago and Baltimore. Murders in the U.S. rose nearly 9% last year, and one-third of that increase came from just a few neighborhoods in Chicago, according to a Wall Street Journal analysisof the FBI’s annual 2016 publication,Crime in the United States. 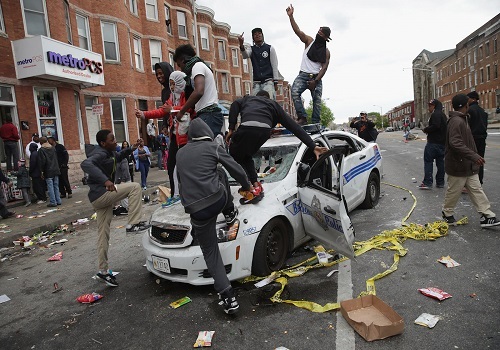 Crime is concentrated in failed American inner cities, where a war zone has unfolded, demonstrating that decades of failed liberal policies was merely an experiment gone wrong.